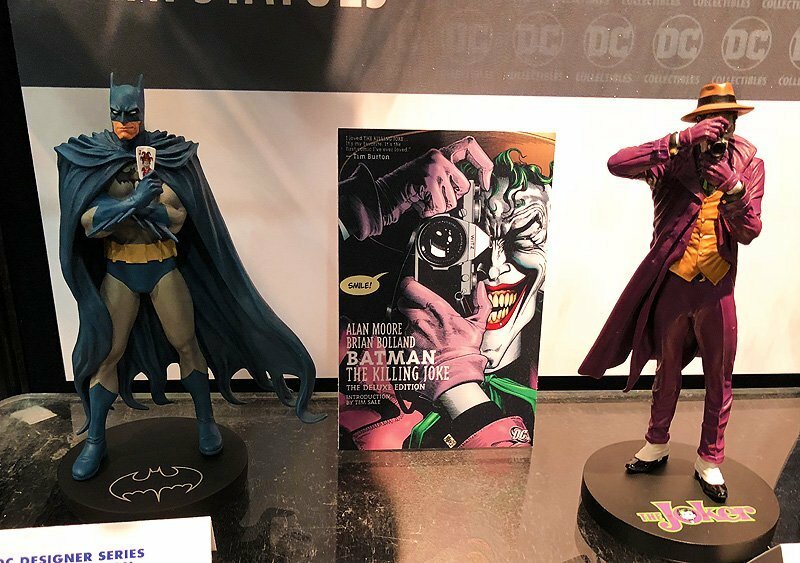 DC Collectibles Toy Fair Gallery Including Batman & More! DC Collectibles, the award-winning line of collectibles from DC Entertainment, is celebrating 20 years of toy making at this year’s American International Toy Fair in New York. To commemorate this milestone anniversary, DC Collectibles revealed huge plans for its 2018 lineup, including several high-profile collaborations such as a life-size bust of The Joker designed by one of Hollywood’s most celebrated special makeup effects artists, Rick Baker. We got to photograph the collection on the Toy Fair floor, and you can check out our DC Collectibles Toy Fair gallery, including an unboxing of a Toy Fair exclusive statue by Chris Uminga, via the link below! Capitalizing on excitement for the upcoming DC Artists Alley designer vinyl line, DC Collectibles revealed new variants for the Hainanu “Nooligan” Salque and Sho Murase waves of figures. Black-and-white editions will be offered for Nooligan’s standard designs of Batman, The Joker and Harley Quinn, and special holiday designs will be offered for Murase’s Poison Ivy, Harley Quinn and Catwoman characters. These new variants join the already-announced standard and black-and-white versions of the Chris Uminga wave that debuts in June. Uminga’s wave will be followed by Nooligan’s vinyls in September and Murase’s in November. RELATED: Toy Fair 2018: DC Collectibles Reveals Doomsday Clock Figures and More!